IBA depends on your continuous support for the success of its activities. 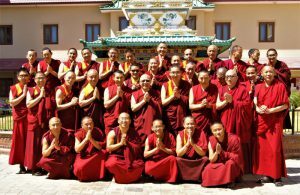 You can join our efforts by sponsoring the studies of a monk at IBA or the translation of an important text, or by making a donation towards the rebuilding and maintenance of the IBA buildings damaged during the earthquakes of 2015 and the wellbeing association of our monastic students to cover their medical expanses. We thank you so much for your kind help. IBA’s Monastic Leaders Program trains talented graduates from a selection of monastic philosophical colleges to become textual and oral translators, administrators and teachers to serve their monasteries and the wider dharma community. You can make a basic or full sponsorship pledge for a year or more, or alternatively you may wish to give a one-time donation for an amount of your choice. Basic sponsorship of US$85 per month/$1020 per year will cover one monk’s basic needs such as food and accommodation. Full sponsorship of US$150 per month/US$1800 per year will completely support one monk’s basic living costs plus a proportion of the annual educational costs of the Monastic Leaders Program. Supporter: donate any amount towards Chödung Karmo’s translation projects. The earthquakes of April 25 and May 12, 2015, caused damage to varying degrees to IBA, leaving two buildings unsafe, while another two are still in a usable condition. Since then, repairs are well on their way, but we are still in need of financial support to complete the rebuilding and maintenance of the IBA campus. The IBA Student Health and Wellbeing Association was founded at the request of Khenpo Ngawang Jorden in 2010 for the express purpose of assisting with students’ medical needs. Donations will directly benefit students on the Monastic Leaders Program. All funds received will be spent solely on essential medial items and treatment. If you wish to help us with repair of the earthquake damage or for any other purpose, please contact us via our email ibanepal888@gmail.com for details on how to donate. On behalf of the IBA community, we would like to thank our friends and supporters for their generous donations in this difficult time as we work towards the renewal and rebuilding of IBA.